A winning campaign cannot be achieved without support from alumni, fans, parents and friends. We need your help. 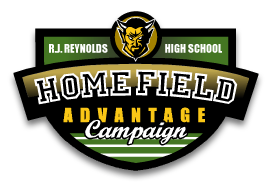 This is your opportunity to further empower R.J. Reynolds High School and the community by making a gift to the R.J. Reynolds Home Field Advantage Campaign. Would you like your donation to be earmarked to one of our challenges? Are you a parent or friend of Reynolds HS? Allow your name to be included in the donors list? © 2012. R.J. Reynolds Home Field Advantage, Inc.